According to a new clinical trial by researchers at the All India Institute of Medical Sciences in New Delhi, India, a daily dose of supplemental glutamine improves intestinal permeability more effectively than whey protein. Glutamine is a non-essential amino acid that helps maintain gut barrier function by providing fuel for rapidly dividing cells—especially enterocytes (absorptive cells) as well as the epithelial cells that line the intestines. During their controlled trial, which appeared in the journal Digestive Diseases and Sciences, the researchers randomized 30 middle aged men in need of permeability support into two groups. The first group was given a daily glutamine supplement containing 0.5 g of the amino acid per kilogram of ideal body weight. The second group received whey protein, also at 0.5 g per kilogram of ideal body weight. After two months, intestinal permeability in each participant was assessed by measuring the ratio of lactulose and mannitol that was excreted in their urine. While those in the whey protein group showed some improvement, the greatest benefit was found in those taking supplemental glutamine. Not only did the glutamine support a healthier intestinal barrier function, it also improved morphology. 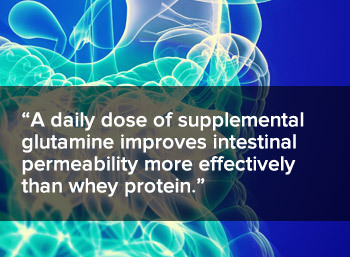 These new findings reinforce earlier research suggesting that glutamine supports healthy intestinal barrier function. Benjamin J, Makharia G, Ahuja V, Anand Rajan KD, Kalaivani M, Gupta SD, Joshi YK. Glutamine and whey protein improve intestinal permeability and morphology in patients… a randomized controlled trial. Digestive Diseases and Sciences. 2012 Apr;57(4):1000-1012.